Supreme Court taking us for a ride back in time. were in for the holy roller ride of our lives! AND IN THIS DAY AND AGE OF SCIENCE TECHNOLOGY? PS: Please wake me when it's over! The Supreme Court justice took on the majority opinion in a biting dissent. The Supreme Court on Monday weakened Obamacare's controversial contraception mandate, ruling 5-4 that some employers cannot be forced to cover birth control as part of their health insurance plans. The majority opinion, written by conservative Justice Samuel Alito, said such a mandate infringes on religious freedom, and therefore can be waived by certain business owners. they judge incompatible with their sincerely held religious beliefs." 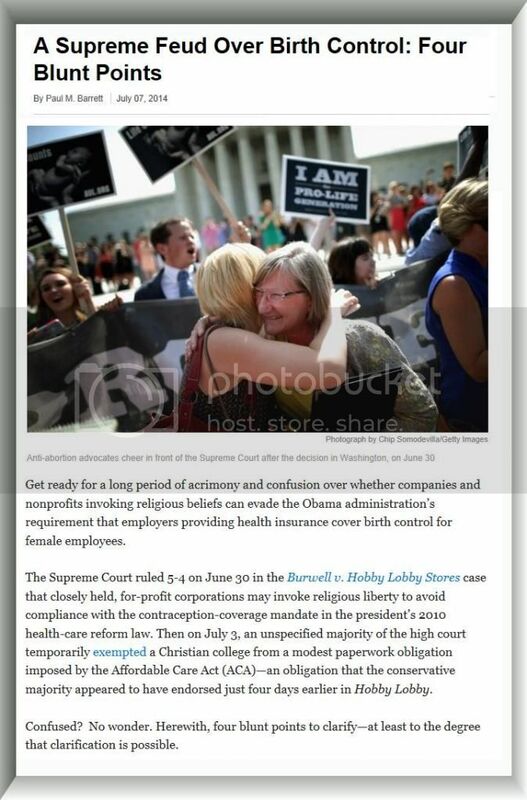 The majority view "demands accommodation of a for-profit corporation's religious beliefs no matter the impact that accommodation may have on third parties who do not share the corporation owners' religious faithin these cases, thousands of women employed by Hobby Lobby and Conestoga or dependents of persons those corporations employ," wrote Ginsburg, a stalwart member of the Court's liberal wing. She continued: "Persuaded that Congress enacted the (Religious Freedom Restoration Act) to serve a far less radical purpose, and mindful of the havoc the Court's judgment can introduce, I dissent." 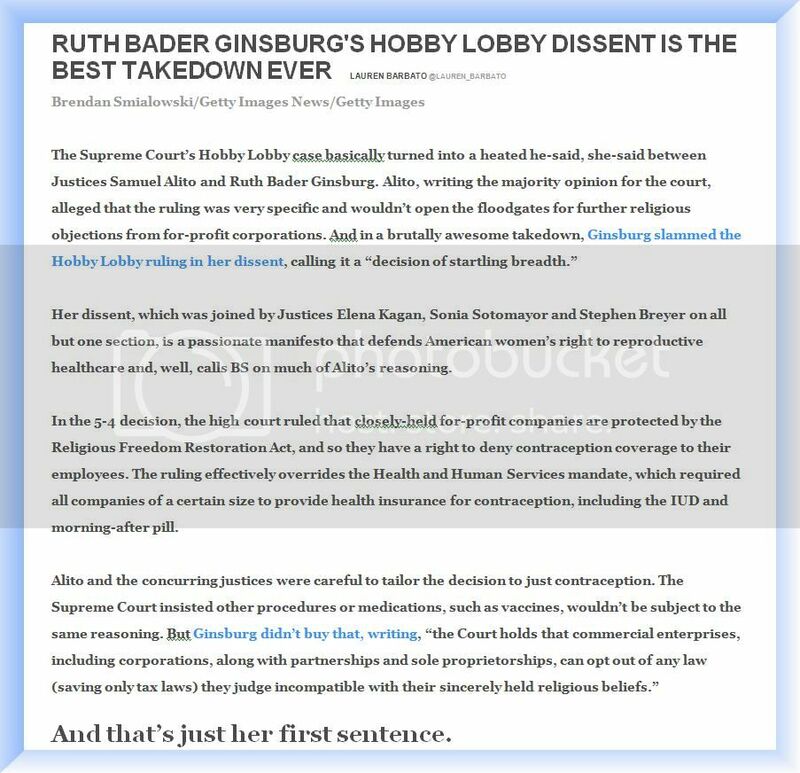 Ginsburg's opinion reasons that religious groups exist to serve the explicit interests of their adherents, while for-profit companies serve a fundamentally different purpose. Bucking the majority, Ginsburg sides with the Obama administration's claim that for-profit companies do not possess religious rights under the RFRA. Granting them such rights, Ginsburg contends, could allow employers to trample over any number of health care needs in the name of religious objection.